Discover the real-life mystery centered on the queen of crime herself: Agatha Christie. In this tantalizing new novel, Christie’s mysterious ten-day disappearance serves as the starting point for a gripping novel, in which Christie herself is pulled into a case of blackmail and murder. Agatha Christie, in London to visit her literary agent, is boarding a train, preoccupied with the devastating knowledge that her husband is having an affair. She feels a light touch on her back, causing her to lose her balance, then a sense of someone pulling her to safety from the rush of the incoming train. So begins a terrifying sequence of events—for her rescuer is no guardian angel, rather he is a blackmailer of the most insidious, manipulative kind. Writing about murder is a far cry from committing a crime, and Agatha must use every ounce of her cleverness and resourcefulness to thwart an adversary determined to exploit her expertise and knowledge about the act of murder to kill on his behalf. 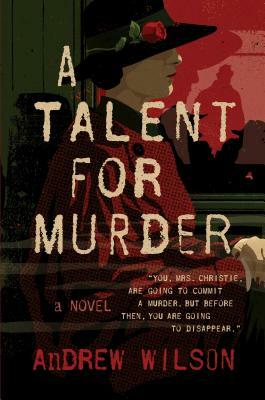 In A Talent for Murder, Andrew Wilson ingeniously explores Agatha Christie’s odd ten-day disappearance in 1926 and weaves an utterly compelling and convincing story around this still unsolved mystery involving the world’s bestselling novelist. Andrew Wilson is an award-winning journalist and author. His work has appeared in a wide variety of publications including the Guardian, the Washington Post, the Sunday Times, and the Smithsonian Magazine. He is the author of four acclaimed biographies, a book about the survivors of the Titanic, and the novels, The Lying Tongue, A Talent for Murder, A Different Kind of Evil, Death in a Desert Land. "The queen of crime is the central character in this audacious mystery, which reinvents the story of her mysterious disappearance with thrilling results." "Equal parts psychological thriller, detective fiction, and mystery. Readers will become emotionally involved with the protagonist, whom Wilson portrays as both sympathetic and quick witted." "A fast-paced, pleasingly twisted and creepy thriller...reads like an amalgamation of a clever Agatha Christie puzzler with the darker characters and psychological insights found in Patricia Highsmith's thrillers...With Strong characters, shrewd plotting and a skillful blending of fact and fiction, A Talent for Murder is a compelling period mystery that will keep whodunit fans captivated."